The Ikon Pro 10 light 25mm remote RGB LED decking light kit is rated IP67 and features a unique design of removable and interchangeable heads. The new Fresnel lenses improve lumen output, diffusing the spread of light evenly. Supplied with a remote control that allows remote operation of the yellow-white-red-green-blue-purple-light blue LED phases. Designed to be fitted and wired during the decking build stage without the heads. The supplied rubber caps protect the fitting from the elements until the decking is complete. Each individual IP67 head easily connects and can be placed into position quickly, adding the final touches to the decking design. A 20mm cutout is required for each head. Making sure you have the correct IP rated lights for your deck area is vital and we have a wide range of options in our main decking lights section. 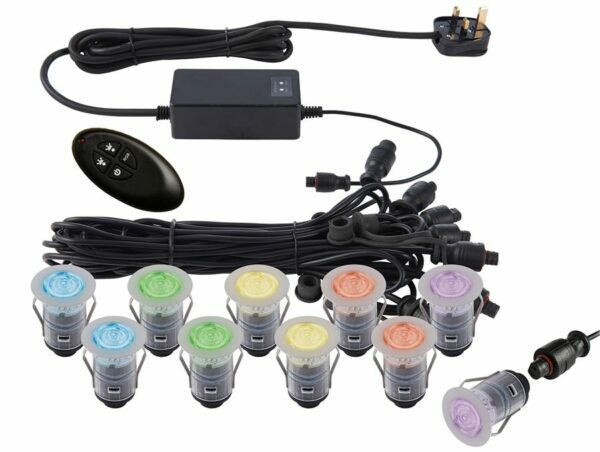 Choose from standard, single or multi coloured lights.